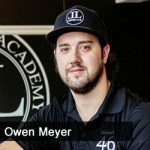 Gary Pinkerton focuses on the entrepreneur’s mindset, as he talks with the founder of Liquor Labs, Owen Meyer. Owen is a graduate from West Point and realized as his time in the service was ending that he wanted to strike out on his own. Along the way Owen discovered he could make money teaching people how to make mixed drinks as a group activity. Hear this entrepreneurial tale and how the world today allows you to test your ideas with very little money.